Visiting Philadelphia and seeking to get a place to swim? Nice selection! Don't neglect to tell us how did it go. 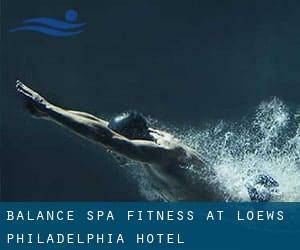 Introducing now Balance Spa & Fitness at Loews Philadelphia Hotel swimming pool, an awesome swimming pool sent by a swimmer like you few days ago. Have you visit this pool? Do you perform here? Please, contact us if you have information that you feel is gonna be useful and bear in mind from now on you are able to now promote each pool just by sharing this page with your friends or adding comments within the Facebook boxes below. Come on and assistance this pool to be the first in Philadelphia! Among all the activities offered by the center, if you are considering swimming you will take pleasure in aprox.20 meters, 2 lanes, Indoors. Just in case you want to contact this Swimming Pool just before dropping by, we only know the phone number. Write down the GPS coordinates we have on our file for this Pool, so you can enter them into your GPS to aid you locate the Swimming Pool easily. Updated on 2019 5120 Chestnut St. , Philadelphia , PA , USA (Postal Code: 19139). This sports center offers 25 yards x 32 meters, 6 lanes, Indoors. For this Pool, only phone number is number here. Updated on 2019 4401 ´G´ St. , Philadelphia , PA , USA (Postal Code: 19120). This sports center offers 20 yards, Indoors. Contact information for this Swimming Pool such as phone number and email address are number. Updated on 2019 1400 N. Broad St. , Philadelphia , PA , USA (Postal Code: 19121). This sports center gives 25 meters, 6 lanes, Indoors. For this Swimming Pool, only phone number is number here. Updated on 2019 1073 Ridge Ave. at Domino Lane , Philadelphia , PA , USA (Postal Code: 19128). This sports center gives 25 yards x 25 feet, 4 lanes, Indoors. For this Swimming Pool, only phone number is number here. Updated on 2019 4200 Wissahickon Avenue , Philadelphia , PA , USA (Postal Code: 19129). Among all of the activities offered by the center, for anybody who is considering swimming you can expect to appreciate 25 yards x 25 meters, 10 lanes, 3.5 feet - 10 feet depth, 10.5f maximum depth, Indoors. Just in case you need to contact this Swimming Pool prior to dropping by, we only know the phone number. Updated on 2019 Rowland Ave. and Shelmire Ave. , Philadelphia , PA , USA (Postal Code: 19136). This sports center offers 25 meters, 6 lanes, Indoors. Contact information for this Pool including phone number and e-mail address are number. Updated on 2019 5835 Spruce Street , Philadelphia , PA , USA (Postal Code: 19139). Among all of the activities supplied by the center, if you are considering swimming you'll get pleasure from 25 yards, Indoors. If you'll want to contact this Swimming Pool, e-mail address and phone number are both number. 3701 Walnut St. , Philadelphia , PA , USA (Postal Code: 19104). Swimmers like you reported Olympic size, 6 lanes or 6 + 6 lanes, Indoors. Unfortunately we do not have the email address of this Pool, but we can give you the phone number. Updated on 2019 5722 Greene St. , Philadelphia , PA , USA (Postal Code: 19144). This sports center offers 25 yards, Indoors. Contact information for this Swimming Pool which include phone number and email address are number. Updated on 2019 851 Franklin Mills Circle , Philadelphia , PA , USA (Postal Code: 19154). Swimmers like you reported 25 meters, Indoors. Unfortunately we do not have the email address of this Swimming Pool, but we can give you the phone number.